2016 May 9 Steve Nguyen, Ph.D. I often find people confusing and commingling the terms “organization development” and “change management”, even I/O psychology experts and authors. To set the record straight and help clear up this persistent and ongoing confusion, I offer this post on the link between Industrial/Organizational (I/O) Psychology, Organization Development (OD), and Change Management. One problem is that different people define these terms differently, resulting in dilution of constructs. Another issue is that two of the terms — organization development (OD) and change management — are often loosely defined. For instance, many people (even some academics) say/write/use “organizational development” but it is actually organization development (not organizational development). “[The] lack of definitional clarity within OD is partly due to the fragmentation of the literature and differing priorities and perspectives of various scholars and practitioners. . . .[In addition,] OD as a separate research area has struggled for academic legitimacy” (Martins, 2011, p. 693). 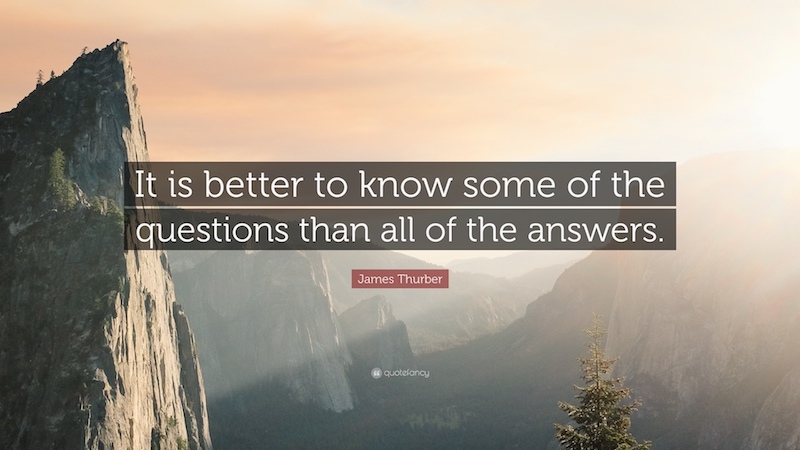 A similar issue applies to change management regarding both the inconsistency in defining it and the lack of theory supporting it. Indeed, in his book, The Theory and Practice of Change Management, Hayes (2010) wrote: “Change management is most effective when the use of tools and techniques is guided by theory” (p. xv). Industrial and Organizational (I/O) psychology is a field of psychology that studies people, work behavior (performance of tasks), and work settings to understand how behavior can be influenced, changed, and enhanced to benefit employees and organizations (Zedeck, 2011). “Organization development is a system-wide application and transfer of behavioral science knowledge to the planned development, improvement, and reinforcement of the strategies, structures, and processes that lead to organization effectiveness” (Cummings & Worley, 2009, pp. 1-2). 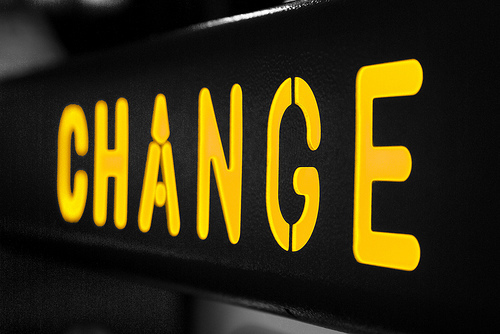 Change management is the capability and set of interventions for leading and managing the people side of change to achieve a desired outcome. It’s about people adopting new mindsets, policies, practices, and behaviors to deliver organizational results (Aguirre, Brown, & Harshak, 2010). Organization development (OD) is a specialization within I/O psychology (Muchinsky, 2006; SIOP, 2016), and under OD is an area called change management (Cummings & Worley, 2009). McLean (2006) said, “it is a mistake to equate OD with change management” (p. 13). Cummings and Worley (2009) remarked that OD is often confused with and mistakenly used to also mean change management. 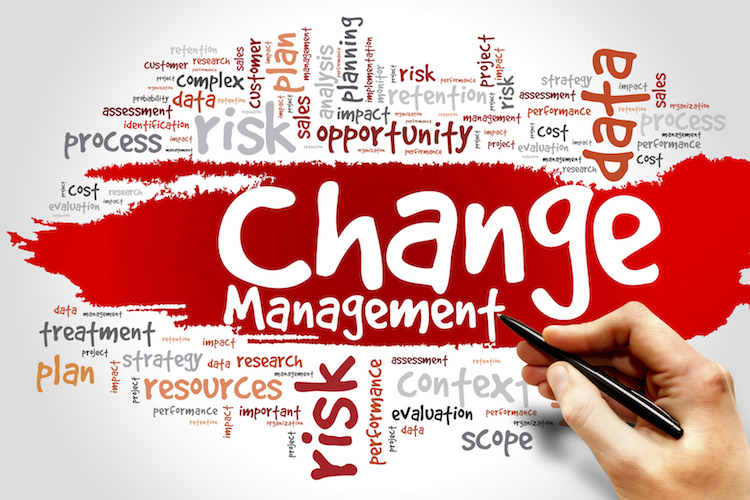 “OD and change management both address the effective implementation of planned change. They are both concerned with the sequence of activities, the processes, and the leadership that produce organization improvements. They differ, however, in their underlying value orientation. OD’s behavioral science foundation supports values of human potential, participation, and development in addition to performance and competitive advantage. Change management focuses more narrowly on values of cost, quality, and schedule. As a result, OD’s distinguishing feature is its concern with the transfer of knowledge and skill so that the organization is more able to manage change in the future. Change management does not necessarily require the transfer of these skills. In short, all OD involves change management, but change management may not involve OD” (Cummings & Worley, 2015, pp. 3-4). OD’s focus is on the whole system, while change management’s focus is on supporting the individual transitions that collectively result in organizational change (Creasey, 2015). Creasey, Jamieson, Rothwell, and Severini (2016) offered a fantastic explanation about the overlapping and distinguishing features of organization development and change management (in Figure 22.1 on p. 334). 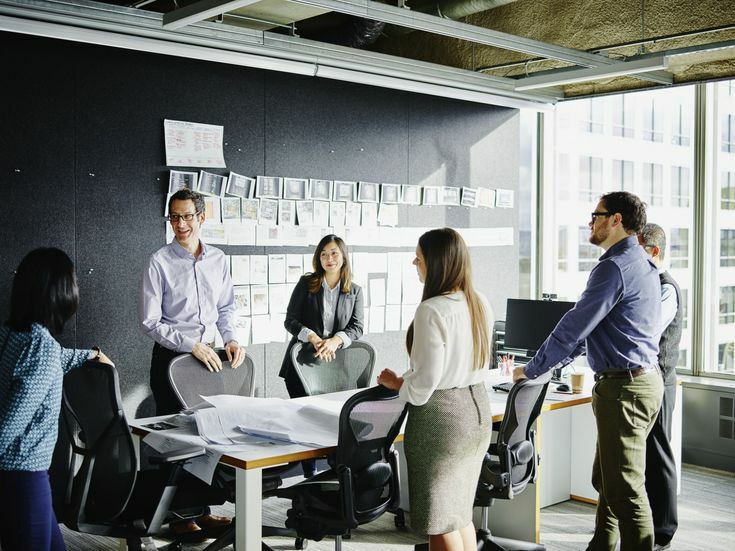 Focus on improving organizational effectiveness, supporting return on investment (ROI) of change initiatives and increasing the alignment between employee behaviors and strategic imperatives. Organization Development (OD) is more often a whole system application— taking an open systems thinking approach, involved earlier in the change life cycle and defining opportunities. OD is more focused on “how the system functions” as the building block of successful change and how people get along and work together effectively on an interpersonal level in the change process. OD is more focused on designing interventions to modify higher order organizational components (e.g., organization structures, systems, processes, and relationships) (Creasey, Jamieson, Rothwell, & Severini, 2016, p. 334). Change Management (CM) is more often project application—taking an “catalyzing individual employee change” approach, involved in implementation and taking a delivery approach. CM is more focused on “how to catalyze individual employees in changing how they do their jobs” as the building block of successful change. CM is more focused on applying structured approaches to facilitate individual adoption of changes to an employee’s processes, workflows, and behaviors in specific initiative execution (e.g., through targeted assessments, processes, tools, etc.) (Creasey, Jamieson, Rothwell, & Severini, 2016, p. 334). “In the news, organizational change is often portrayed as revolutionary (as opposed to incremental) and as directly attributable to the actions of specific individuals, most notably a new CEO, or a few heroic individuals. . .In contrast, the I/O psychology literature…has generated a large body of literature describing the ingredients of successful change. What this literature suggests is that the success of a change effort is ultimately the result of how change recipients — those employees who are affected by the change — receive it. . .Given the importance of the human element in successful planning and implementation of change, I/O psychology has a lot to contribute to organizational change management” (Truxillo, Bauer, & Erdogan, 2016, pp. 545-546). “Ultimately, all change efforts boil down to the same mission: Can you get people to start behaving in a new way?” (Heath & Heath, 2010, p. 4). Creasey, T., Jamieson, D. W., Rothwell, W. J., & Severini, G. (2016). Exploring the relationship between organization development and change management. In W. J. Rothwell, J. M. Stavros, & R. L. Sullivan (Eds. ), Practicing organization development: Leading transformation and change (4th, pp. 330-337). Hoboken, NJ: John Wiley & Sons. Cummings, T. G., & Worley, C. G. (2015). Organization development and change (10th ed.). Stamford, CT: Cengage Learning. Hayes, J. (2010). The theory and practice of change management (3rd Ed.). Palgrave MacMillan. Martins, L. L. (2011). 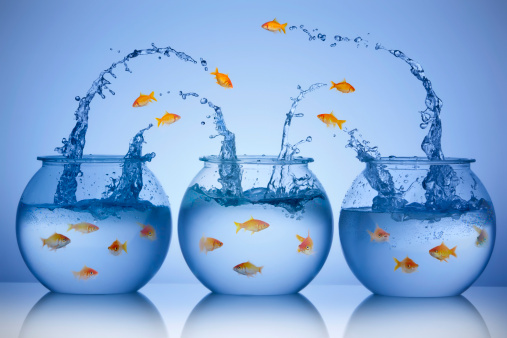 Organizational change and development. In S. Zedeck (Ed. 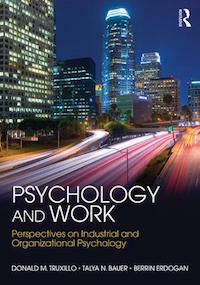 ), APA handbook of I/O psychology (Vol. 3, pp. 691-728). Washington, DC: American Psychological Association. McLean, G. N. (2006). Organization development: Principles, processes, performance. 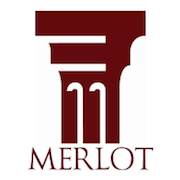 San Francisco, CA: Berrett-Koehler Publishers. 2013 June 5 Steve Nguyen, Ph.D. In my former career as a mental health counselor, I encountered many clients who struggled with taking charge of their own lives. While their struggles might have differed, the idea behind helping them was almost always the same, and quite basic. We’re taught to guide clients from seeing themselves as being victims of life’s circumstances to being movers of those life events. In other words, help clients reach deep within to draw on their own inner strength and capacity to take charge. There are two types of locus of control: internal (inside) and external (outside). Internal locus of control is the belief that you are “in charge of the events that occur in [your] life” (Northouse, 2013, p. 141), while external locus of control is the belief that “chance, fate, or outside forces determine life events” (p. 141). Individuals with an internal locus of control believe their behaviors are guided by their personal decisions and efforts and they have control over those things they can change. Having an internal locus of control is linked to self-efficacy, the belief you have about being able to do something successfully (Donatelle, 2011). People with an external locus of control see their behaviors and lives as being controlled by luck or fate. These individuals view themselves (i.e., their lives and circumstances) as victims of life and bad luck. “People differ in whether they feel they control the consequences of their actions or are controlled by external factors. External control personality types believe that luck, fate, or powerful external forces control their destiny. Internal control personality types believe they control what happens to them” (Champoux, 2011, p. 113). In leadership and management, this concept of locus of control is the same. Whether it’s coaching top executives, middle management, or rank and file employees, the idea is to get them to stop making excuses and/or blame other people, events, or things (i.e. external locus of control), and instead start taking responsibilities (i.e., internal locus of control) for them. If you really listen, you’ll often hear people describe their lives or work as spinning out of control or they felt they had very little control over or were not in control of their lives. However, when things improve, you’ll hear them say that they’ve started feeling more in control or regaining control over their lives again. “When the locus of control shifts from the external to the internal frame, clients find more energy, motivation, and greater confidence to change” (Moore & Tschannen-Moran, 2010, p. 75). 1. An internal locus of control is one of the key traits of an effective leader (Yukl, 2006). “A leader with an internal locus of control is likely to be favored by group members. One reason is that an ‘internal’ person is perceived as more powerful than an ‘external’ person because he or she takes responsibility for events. The leader with an internal locus of control would emphasize that he or she can change unfavorable conditions” (Dubrin, 2010, p. 47). 2. An internal locus of control separates good from bad managers (Yukl, 2006). “Effective managers . . . demonstrated a strong belief in self-efficacy and internal locus of control, as evidenced by behavior such as initiating action (rather than waiting for things to happen), taking steps to circumvent obstacles, seeking information from a variety of sources, and accepting responsibility for success or failure” (Yukl, 2006, pp. 185-186). 3. Employees’ locus of control affect leadership behavior in decision-making (Hughes, Ginnett, & Curphy, 2012). “Internal-locus-of-control followers, who believed outcomes were a result of their own decisions, were much more satisfied with leaders who exhibited participative behaviors than they were with leaders who were directive. Conversely, external-locus-of-control followers were more satisfied with directive leader behaviors than they were with participative leader behaviors. Followers’ perceptions of their own skills and abilities to perform particular tasks can also affect the impact of certain leader behaviors. Followers who believe they are perfectly capable of performing a task are not as apt to be motivated by, or as willing to accept, a directive leader as they would a leader who exhibits participative behaviors” (Hughes, Ginnett, & Curphy, 2012, pp. 544-545). “There is also evidence that internals are better able to handle complex information and problem solving, and that they are more achievement-oriented than externals (locus of control). In addition, people with a high internal locus of control are more likely than externals to try to influence others, and thus more likely to assume or seek leadership opportunities. People with a high external locus of control typically prefer to have structured, directed work situations. They are better able than internals to handle work that requires compliance and conformity, but they are generally not as effective in situations that require initiative, creativity, and independent action” (Daft, 2008, p. 103). “Path–goal theory suggests that for subordinates with an internal locus of control participative leadership is most satisfying because it allows them to feel in charge of their work and to be an integral part of decision making. 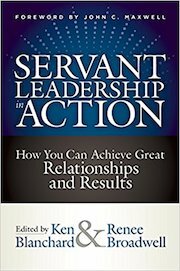 For subordinates with an external locus of control, path–goal theory suggests that directive leadership is best because it parallels subordinates’ feelings that outside forces control their circumstances” (Northouse, 2013, p. 141). Meta-analyses (the synthesis of multiple studies into a single study by summarizing the practical significance of each research finding into one combined effect) of 357 research studies “showed that an internal locus of control was associated with higher levels of job satisfaction and job performance” (Colquitt, LePine, & Wesson, 2015, p. 287) and “that people with an internal locus of control enjoyed better health, including higher self-reported mental well-being, fewer self-reported physical symptoms” (Colquitt et al., 2015, p. 287). Takeaway Message: Having an internal locus of control can go a very long way in differentiating between effective and ineffective leaders, managers, and employees. Champoux, J. E. (2011). Organizational behavior: Integrating individuals, groups, and organizations (4th ed). New York: Routledge. Colquitt, J. A., LePine, J. A., & Wesson, M. J. (2015). Organizational behavior: Improving performance and commitment in the workplace (4th ed.). New York: McGraw-Hill Education. Daft, R. L. (2008). The leadership experience (4th ed.). Mason: OH: Thomson/South-Western. Donatelle, R. (2011). Health: The basics (Green ed.). San Francisco: Pearson Benjamin Cummings. Dubrin, A. J. (2010). Leadership: Research findings, practice and skills (6th ed.). Mason, OH: South-Western/Cengage Learning. Moore, M. & Tschannen-Moran, B. (2010). Coaching psychology manual. Baltimore, MD: Wolters Kluwer/Lippincott Williams & Wilkins. Yukl, G. (2006). Leadership in organizations (6th ed.). Upper Saddle River, NJ: Pearson/Prentice Hall. 2010 February 5 Steve Nguyen, Ph.D.
Anchor New Approaches in the Corporate Culture: Create better performance via customer- and productivity-oriented behavior, more and better leadership, and more effective management; articulate the connections between the new behaviors and organizational success; develop the means to ensure leadership development and succession. Professor Kotter (1996) shared about a time he consulted with an intelligent and competent executive who struggled trying to implement a reorganization. Problem was many of his managers were against it. Kotter went through the 8-stage process. He asked the executive whether there was a sense of urgency (Stage #1) among the employees to change. The executive said, “Some do. But many probably do not.” (Kotter, 1996, p. 22). When asked about a compelling vision and strategy to implement (Stage #3), the executive replied, I think so [about the vision]…although I’m not sure how clear it [the strategy] is” (Kotter, 1996, p. 22). Finally, when Kotter inquired whether the managers understood and believed in the vision, the executive responded, “I wouldn’t be surprised if many [people] either don’t understand the concept or don’t entirely believe in it [the vision]” (Kotter, 1996, p. 22). Kotter (1996) states that when Stages #1-4 of the Kotter model are skipped it’s inevitable that one will face resistance. The executive ran into resistance because he went directly to Stage #5. Kotter states that in attempting to implement change, many will rush through the process “without ever finishing the job” (Kotter, 1996, p. 22) or they’ll skip stages and either jump to or only do Stages 5, 6, and 7. Schermerhorn, Hunt, and Osborn (2005) maintain that when employees resist change they are protecting/defending something they value and which seems threatened by the attempt at change. Compatibility: The change should be as compatible as possible with the existing values and experiences of the people being asked to change. Complexity: The change should be no more complex than necessary; it must be as easy as possible for people to understand and use. Education & Communication: educate people about a change before it is implemented; help them understand the logic behind the change. Participation & Involvement: allow people to help design and implement the changes (e.g., ideas, task forces, committees). Facilitation & Support: provide help (emotional & material resources) for people having trouble adjusting to the change. Negotiation & Agreement: offers incentives to those who resist change. Manipulation & Cooptation: attempts to influence others. Explicit & Implicit Coercion: use of authority to get people to accept change. ***For additional (and quite valuable) information related to the six methods for dealing with resistance to change outlined by Schermerhorn and colleagues, there is a Harvard Business Review article by Kotter and Schlesinger (1979 & 2008). The 2008 article, “Choosing Strategies for Change” is a reprint of the same 1979 article. For better layout and graphics, I’ve referred to the 2008 article. 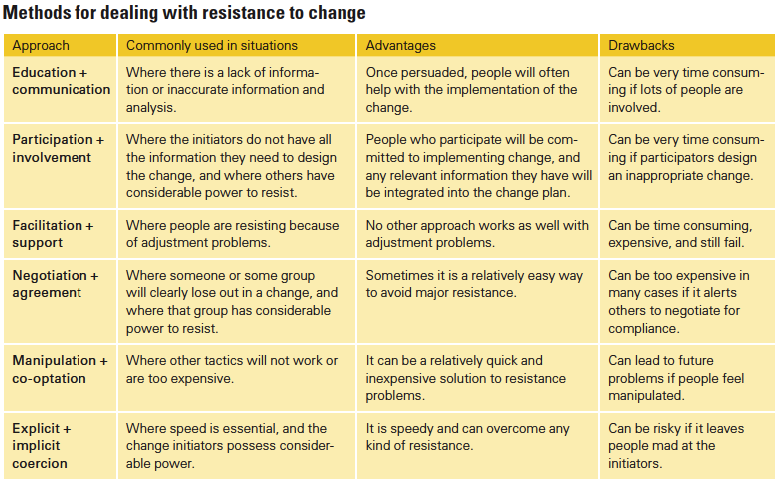 I believe the six methods for dealing with resistance to change outlined by Schermerhorn and colleagues (2005) is based on or came directly from Kotter and Schlesinger’s 1979 article. ***In Kotter and Schlesinger’s 1979 HBR article (and in the 2008 HBR reprint) the six methods for dealing with resistance to change included the six approaches (e.g., education + communication, negotiation + agreement, etc.) as well as three more columns (commonly used in situations; advantages; and drawbacks). I found this to be especially useful and have posted a screenshot (above) of the graphic used in Kotter and Schlesinger’s 2008 HBR article. I would encourage readers to read Kotter and Schlesinger’s HBR article. Kotter, J. P. & Schlesinger, L. A. (1979). Choosing strategies for change. Harvard Business Review, 57(2), 106-114. Kotter, J.P. (1996). Leading change. Boston, MA: Harvard Business School Press.